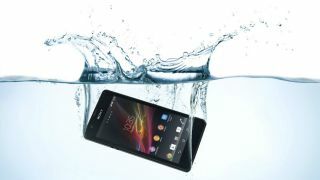 Sony has introduced the Xperia ZR, built with up to 1.5 meters of water resistance for snapping photo and video in those submerged situations. To make sure those underwater snaps are both taken and viewed in decent quality, the phone comes with a 13 megapixel fast capture camera and 4.6-inch HD Reality display with the same Mobile Bravia Engine 2 tech of the Xperia Z. However, the panel is just a 720p. You'll be able to keep the phone submerged in water for up to 30 minutes at 1.5 meters, although this is only good for fresh water situations - no taking it out into the big blue, we're afraid. On the plus, the dedicated camera button is a big pro that was missed on the Z. As for the engine, the ZR holds a Qualcomm Snapdragon S4 quadcore 1.5 GHz processor, 2GB of RAM, 8GB of internal storage, 4G LTE and NFC support. The screen, meanwhile, offers a "prediction filter" which aims to, yup, predict where you're finger is going when you're scrolling around the display. The dimensions make it slightly smaller than the Xperia Z, while the phone is also dust-proof, meaning it will be an appealing buy for many of the intrepid adventurers out there. Sony's not saying anything on price just yet, but has confirmed that the phone will launch "in various global" markets starting quarter 2 of this year.